Amid a growing chorus for implementing prohibition in Tamil Nadu, All India Anna Dravida Munnetra Kazhagam on Thursday said the Jayalalithaa-led government was taking all steps to make the state ‘liquor-free’, and lambasted arch rival Dravida Munnetra Kazhagam for having “taught Tamils to drink” by removing prohibition in 1971. Taking a swipe at DMK president M Karunanidhi’s statement that his party would take steps to implement prohibition if voted to power in the next elections, AIADMK said it was done with an eye on polls. He had come out with such a “fraudulent” assurance in 1996 assembly polls too, party mouthpiece ‘Dr Namathu MGR’ said. It said the DMK chief paid no heed to the plea of veteran freedom fighter and Swantantra Party leader C Rajagopalachari, who had urged him against removing prohibition. The DMK patriarch, then chief minister, had also defended his action saying how it was possible to continue the dry regime in Tamil Nadu, as it was like a “camphor surrounded by fire”, referring to the absence of any prohibition policy in the neighbouring states. “It was Karunanidhi who taught an entire generation of Tamils to drink by throwing open liquor shops, paying no heed to Rajaji’s fervent plea,” it charged. However, soon after Jayalalithaa took over as CM for the first time in 1991, she had issued orders to close down shops selling cheap liquor, it recalled. Karunanidhi made “fraudulent” assurances in the 1996 polls that prohibition will be implemented, “but did not move a stone”, then and even during his party’s 2006 rule, it said. 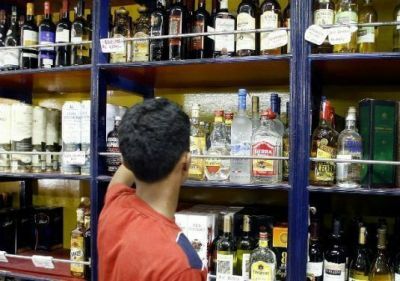 As liquor outlets were turning out to be the ‘root cause’ of criminal activities, it was the AIADMK government which ‘regulated’ them and ended spurious liquor and anti-social elements by nationalising its sales in 2003, it said. It was Jayalalithaa’s “acumen” which helped in ending the practice of DMK syndicate running liquor shops, besides filling the state coffers with the revenue generated from nationalisation of liquor sales, it added. “However, at a time when our Amma’s government is mulling tireless and intelligent steps braving all these (aforesaid) to make Tamil Nadu a liquor-free state, Karunanidhi’s sstatement that steps will be taken for prohibition is done with an eye on the coming polls and is a fraud,” it said. While Paattali Makkal Katchi and Marumalarchi Dravida Munnetra Kazhagam had been for long stressing for implementation of prohibition, DMK had recently joined the bandwagon, only to be slammed by PMK and Bharatiya Janata Party, saying it was done with an eye on assembly elections scheduled in 2016. Liquor sales done through state-run TASMAC outlets bring revenue to government of almost Rs 25,000 crore.